This season the NH Notebook Mr. Football Award is once again up for grabs. Most years this race is wide open, with as many as 8, 9 or even more kids who all have a legit shot. Now the season is far from over, but at this point there are 3 players who have separated themselves from the pack. If you've been following NH football closely this season you can guess who they are - Trevor Knight (Nashua South), Manny Latimore (Pinkerton) and Jesiah Wade (Manchester Central). Here's a closer look at these three star players. The best quarterback in the state, and South can make a pretty good case for being the best team in the state. Knight is a dual threat as both a passer and rusher. Knight is among the state's leaders in passing yards, and is also one of the top rushers in the NHIAA among QBs. His squad is undefeated this far, and he has played particularly well in the team's two biggest games so far - and a 35-14 win last Friday night over Gate City rival BG. In the Exeter game he led the Purple Panthers to a 28-0 2nd half rout, a half which Knight got started with a 73 yard touchdown run. He followed that up with 2 TD passes, and in the win over BG he amassed 477 yards of total offense. In addition to being the best player on an unbeaten team, in just 7 games Knight already has over 1,000 yards and 10 TDs passing and 1,000 yards and 10 TDs rushing. The player most consider to be the best running back in the state, and he's the best player on consensus top 4 team in NH. In just 7 games this season Latimore (pictured above) already has 1,176 yards on the ground and 12 touchdowns, plus 6 catches for 109 receiving yards and 2 more scores. Pinkerton has been one of the state's most dominant programs for a long time now, and Latimore has a chance to finish as one of their all-time best running backs. Not to mention he is absolutely lethal as a kick/punt returner. Against Memorial he had 267 yards and 4 TDs rushing, and vs. Londonderry had 2 rushing touchdowns, plus a 95 yard kickoff return for a TD. Like Latimore, Wade is also arguably the best running back in the state. And like Latimore, Wade has also put up big numbers not only rushing the ball, but also receiving and on returns. They're both 2 of the fastest, most explosive backs NH has seen in years. Nobody though, not even Latimore can touch Wade's numbers. In just 7 games Wade has already rushed for a whopping 1,614 yards and is leading the state in touchdowns. 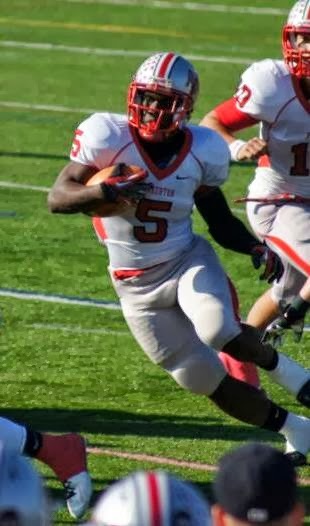 Included in that is his now legendary performance against Merrimack, when he ran for a statewide all-time record 556 rushing yards to go with 6 TDs. Not to mention he is playing for a team that has won 5 games in a row. Keene Blackbirds Quarterback is legit. The west coast needs the love this year. Alex Parenteau is The Player from Keene that you are talking about. He is the best all around player in the state. Just ask Trevor Knight ;) I think Concord or Bedford are the best teams, but Keene has a shot. That's ridiculous. Why would you ask Trevor knight? Because his team lost? Parenteaus team won the game because they played better not because he is a better player. Knight actually threw for more yards and was under constant pressure all night from the Keene defense. It's good to promote players but other players should not be mentioned when doing so. The fact that Keene didn't have a player in the Shrine Game last year. Now that was ridiculous. And who was pressuring him all game? Yep Parenteau. Keene has the best player in the state. Sorry south central NH!